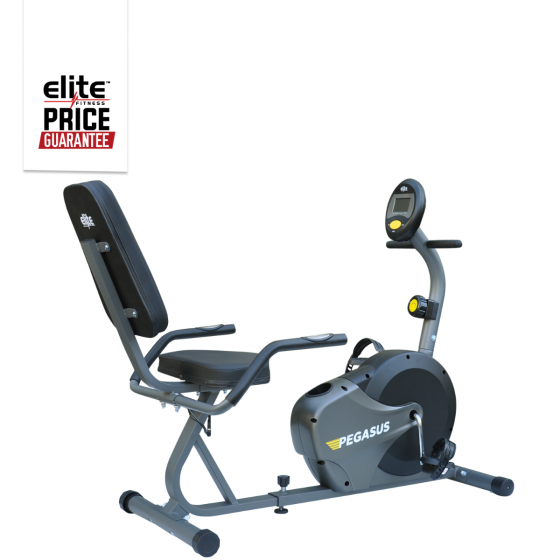 Experience comfort whilst you exercise with the Elite Pegasus Recumbent Exercycle. Recumbent bikes have chair-like seats that offer more back support and reduce strain on your body while you work out. The Pegasus is an excellent piece of home exercise equipment that has been produced using high-quality components but stays within an affordable price range. This exercycle offers a smooth ride for beginners thanks to a heavy precision balanced flywheel and 8 levels of silent magnetic resistance. Stay hydrated while you exercise with the convenient Water Bottle Holder. Monitor your progress with the LCD console, this displays valuable workout feedback on Time, Speed, Distance, Calories and Heart Rate, keeping you motivated and focused on achieving your workout goal! When your workout is complete, the Pegasus is easy to store with built-in transport wheels.